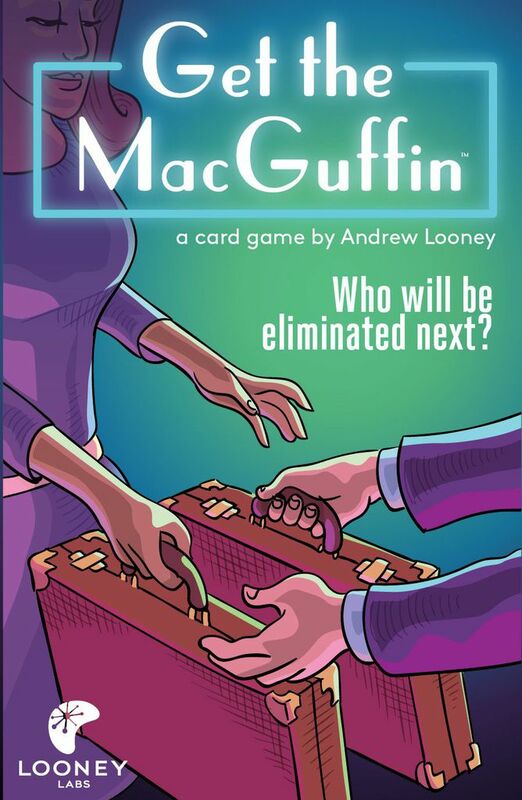 Get the MacGuffin is a game by Andrew Looney, published by Looney Labs. It is for 2-11 players. 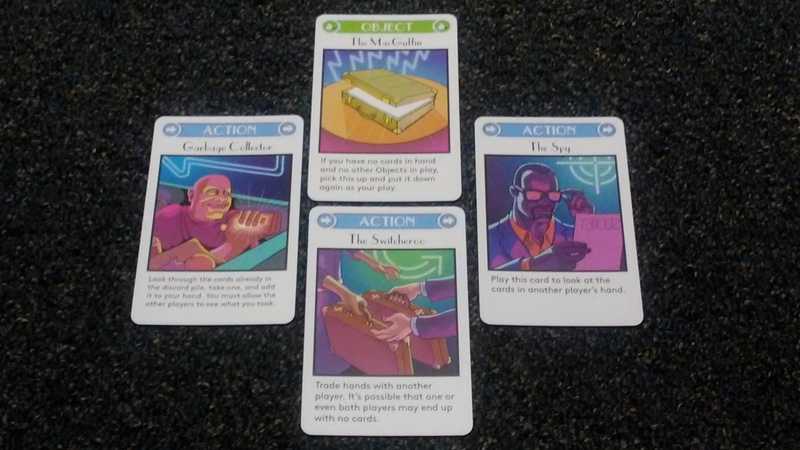 In this game, players will be trying to acquire the ever elusive MacGuffin and eliminate everyone else in their way. Of course holding onto something so elusive isn’t easy, as the other players will be trying to do the same thing. In the end, the last player that remains will be declared the winner. To begin, the cards are shuffled together. The cards are then dealt out to each player, with no player receiving more than 5 cards. Players must have the same number of cards as everyone else, so once there aren’t enough cards to deal out a complete round, the dealer must stop. The extra cards are set aside without anyone looking at what they are. The player to the left of the dealer is the first player. Play now begins. The game is played in a series of turns. Each player takes their turn and play passes to the next player in turn order. On a player’s turn, they must perform 1 of 4 actions. The first action is to play an action card. To do this, the player simply plays the card and performs the action on the card. It is then discarded to the discard pile. Another action the player can take is to play an object card. To do this, the player simply places the object card face up in front of themself. Yet another action is to use an object. To do this the player must first have an object card face up in front of them, before the start of their turn. The player may use the power or the card if it’s power may be applied. This may cause the player to discard the object card in some cases. The last action is to discard an object. To do this the player simply discards the object card in front of them to the discard pile. Of course the player must have had the card in play prior to the start of their turn. Once the player has chosen and performed one of these 4 tasks, play passes to the next player in turn order. It should be noted however, if a player has no cards in their hand or in front of them, they are eliminated from the game. The game continues until only one player remains in the game. The rest of the players having been eliminated due to them having no cards in their hand or on the table in front of them. This final player is the winner. This game comes with a small pack of tarot sized cards. The quality of each one is really good. They have a good thickness and finish on them. They’re easy to shuffle, even with them being larger than your average playing card. The artwork is very interesting. It’s bright and colorful and lends itself quite well to the theme. In some ways, the artwork makes me think of artists like Andy Warhol and Roy Lichtenstein. The colors and style are very fun and playful. There are few familiar faces and some iconic themes present on the cards that you’ll find yourself grinning at. Overall, the cards are very nice and I like the look and feel of this game a lot. If you like the theme, I think you’ll enjoy the cards. The rulebook for this game is a large oversized sheet that folds up nice and neat to fit perfectly inside the pocket sized box. One side of the sheet is nothing but descriptions with full color pictures of each of the 23 cards included in the game. Each card is explained in great detail. The front side of the rule sheet has the actual rules outlined inside a blue box. The remaining sections include definitions, frequently asked questions and tips on playing the game without a table. The rules are actually quite simple and very quick to pickup and learn. A couple of minutes of reading, and you’ll be ready to play. With such simple rules, the sheet could have been quite a bit smaller. However I’m actually quite glad that the back side of the sheet has all the different cards explained. It’s a nice reference to be able to see what might be out there from what’s already been played while actually playing the game. Overall, I’m very pleased with the look and feel of the rules. A very excellent job overall. This is a very quick and simple game to play. It works well with just a few players, or a lot making it a great game to start an evening of gaming or a great filler for between games. It’s also a great portable game. With it being able to fit inside your pocket, along with the tips on playing without a table, you can pretty much play it anywhere. The game itself is a lot of fun. It’s very easy to learn. The small deck of cards reminds me of games like Love Letter, another small deck card game that plays quite fast. I enjoy that it can be played with as few as 2 players or with a larger group. The mechanics of the game make me think of games like Werewolf, where you’re eliminating other characters and using your best detective skills to figure out what card to play and when. There is a little bit of strategy involved in the game, but not so much that you’ll wind up giving yourself a headache from having too many decisions to make. I enjoy the quickness of play. I like that you can blow through the game several times in a row and still have plenty of time to play other games too. The game’s theme reminds me of movies like Pulp Fiction, Citizen Kane and The Maltese Falcon. The idea of trying to collect this particular object and be the last one holding it is played out quite well in this game. I think that fans of any of these particular movies should enjoy the theme and gameplay of this one. Overall this is a really great little card game that I would highly recommend picking up. For more information about this and other great games, please check out Looney Labs at their site. This entry was posted in Reviews and tagged andrew, andrew looney, board, board games, card, card games, get, get the macguffin, labs, looney, looney labs, macguffin. Bookmark the permalink.